BI360 by Solver is a Business Intelligence (BI) and Corporate Performance Management (CPM) suite which includes modules for reporting, budgeting, dashboard and a pre-configured data warehouse. Utilizing a user friendly design, the BI360’s Reporting module offers Excel, web and mobile interfaces with full drill-down and drill-across financial and operational capabilities. Users can easily drag and drop to create complete financial statements and operational reports by using pre-defined templates or the custom design options. Power users can set up a library of reports and dashboards for users to choose from. Example reports include profit and loss, balance sheet, cash flow, sales, HR, project, AR, AP, fixed assets, inventory, and KPI reports. The Reporting module supports automatic scheduling and distribution of reports. You can perform consolidations on any number of companies and automatically or manually eliminate intercompany transactions. Consolidations can be based on one or multiple ERP systems, and with unlimited roll-up hierarchies (trees). BI360’s Reporting module provides IFRS to GAAP adjustments, automatic and manual eliminations and advanced currency conversion. The module is Sarbanes Oxley (SOX) compliant, including audit trial of adjustments. BI360’s Budgeting and Forecasting module is a complete budgeting, forecasting and modeling tool with Excel and Web-based interface. The module allows you to quickly create and deploy input templates based on your existing budget model, or to completely redesign and modernize your model. You can also use a number of pre-defined templates to simplify and expedite the implementation. BI360’s Budgeting and Forecasting module allows for multi-year budgets and rolling forecasts with input forms for profit and loss, balance sheet, cash flow, payroll, capital expenses, revenues, and more. It can perform simple or advanced multi-step allocations, break-back modeling, predictive analytics, and prescriptive analytics as well as take advantage of the advanced workflow, with multi-step approvals, notifications and discussion area. The modern and detailed user security along with the very rich, analytical and easy to understand end-user environment makes BI360 the high value-added business intelligence solution you can count on. BI360’s Dashboard module is a web-based visualization and trend analysis tool which provides real-time dashboards to many pre-integrated, ERP systems as well as to the BI360 Data Warehouse. Dashboards can be highly summarized and KPI-based for executives, but they can also be detailed operational dashboards for line managers and end users across the organization. Data feeds can come from your ERP system as well as from any other data source you feed to the BI360 Data Warehouse. The module can be used stand-alone or in conjunction with the BI360 Reporting and Planning modules. Power users set up a library of dashboards or reports for users to choose from. Individualized dashboards can be designed ‘on-the-fly’ with little training by simply dragging and dropping pre-linked graphical components (“widgets”) onto the screen. In addition, Dashboard allows users to discuss and share information from dashboard analysis. The BI360 Data Warehouse is an easy-to-use, pre-configured and customizable data warehouse with dramatically reduced time/cost for implementation. It uses a non-technical administrative interface and is built on the world-leading Microsoft SQL Server platform. 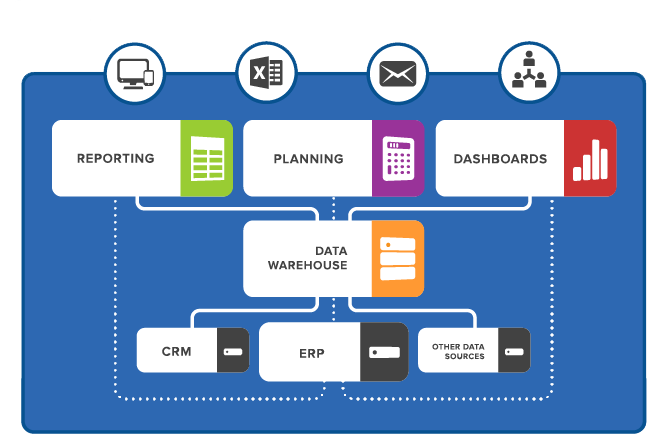 The data warehouse can integrate all of your transactional data sources, whether in-house or cloud-based, into a single BI database. Thanks to BI360 Data Warehouse your data becomes available for consolidated reporting, analysis and dashboards in a secure, collaborative environment. BI360 Data Warehouse comes with pre-configured modules and dimensions for data from the General Ledger, Accounts Payable, Accounts Receivable, Payroll and more, as well as user-defined modules for other data sources. You can schedule your data sources to be imported automatically or to manually import them using easy file import wizards. The Data Explorer feature allows you to quickly check the integrity of the imported data by filtering or grouping data based on dimensions. Additionally, the data warehouse includes advanced currency conversion, consolidation, elimination, and minority features.